With Microsoft's built-in Pocket Outlook PIM being distinctly under-whelming, it's not surprising that third party developers have been busy serving up their own offerings for users seeking more power. We've already reviewed Pocket Informant so we thought we'd take a look at its main rival, Developer One's Agenda Fusion. 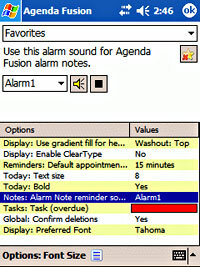 Proclaimed (by its makers, natch) to be the "#1 time and information management solution for your Pocket PC," Agenda Fusion is a comprehensive suite of applications designed to replace the built-in appointments, tasks, notes and contacts tools on your Pocket PC. Installation was straightforward enough with the option to either double-click on the self-installing .exe file on your desktop or download the CAB file directly to your Pocket PC. 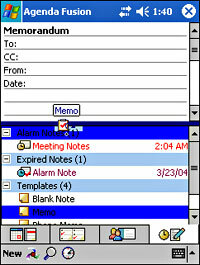 Program files can be installed in the Pocket PC's memory or on a storage card. Once installed, you can assign your hardware buttons to work with Agenda Fusion's views so you need never cast your eyes on the built in PIM tools again. 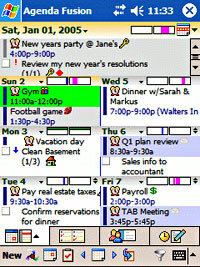 Predictably, the calendar application served up a feast of different views, including Today, Hourly Day, Hourly Week, Week, Agenda, Month, and Year, and you can jump from view to view via a drop down menu. The interface seemed straightforward enough, although some screens looked like they were trying to pack a bit too much functionality in, making some elements of the display a little confusing at first. For example, whenever we tried to input a new appointment in the calendar view, the curious message "<Action btn to insert text>" would appear in the subject box. 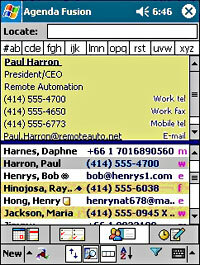 It was only after a while we realised that it was inviting us to select an appointment from a template menu by pressing a hardware button on the Pocket PC. This then offered preset appointment selections like 'Lunch with' or 'Visit' before letting us tick off attendees from the contacts list. Neat. Colours and icons can also be added to the interface to spruce up the week ahead, with the option to have the calendar's colours highlight your working hours. Although we didn't find Agenda Fusion's Contacts interface to be a vast improvement over Pocket Outlook, it does have a few extras, including a preview pane at the top and the ability to attach a mugshot to any specific contact. 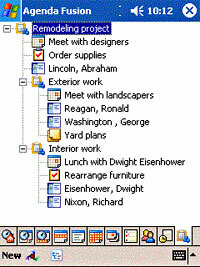 Contacts could also be associated with appointments, tasks, and documents via the Linking feature, with category icons offering quick visual cues. We've never been particularly impressed with the way Pocket PCs handle notes - the Palm OS does it much better, in our opinion. Mind you, Agenda Fusion's Notes has a good stab it at, organising notes and alarm notes in a split screen view, with a preview at the top and a folder view below. There's also a handy Alarm notes feature that takes care of quick notes or voice recordings that can be set to pop-up at any time as a reminder. We were pleased to see that Agenda Fusion had included an integrated project management tool, which lets you organise contacts, tasks, notes, appointments and documents into Projects with the ability to track time and create reports. Usefully, projects can also be linked together to create a larger project, making it easy to track individual phases. In the competitive Pocket PC market, we reckon this feature could prove very compelling to some users. Nice one Fusion! Just like Pocket Informant, there's a baffling array of customisation choices available, letting you adjust anything that could possibly be adjusted, tweaked or fiddled about with - colours, fonts, displays, backgrounds, working days, categories - the lot. Although this amount of control will no doubt appeal to pernickety types that like to have things looking just so, we suspect that many users will be totally overwhelmed by all these choices and thus be deterred from using the program to its full potential. We liked Agenda Fusion, and although it's not perfect, found it to be a very capable and powerful application, with the excellent Projects tool, adding real value to the package. This definitely isn't a program that reveals itself quickly, and its complexity may put off some users, but for those willing to to stick with it and discover what it's got to offer, there's enough productivity benefits on offer to easily justify the $30 investment.